For most of the 20th century Dr Steevens’ Hospital was a working hospital housed in a hodgepodge of buildings. 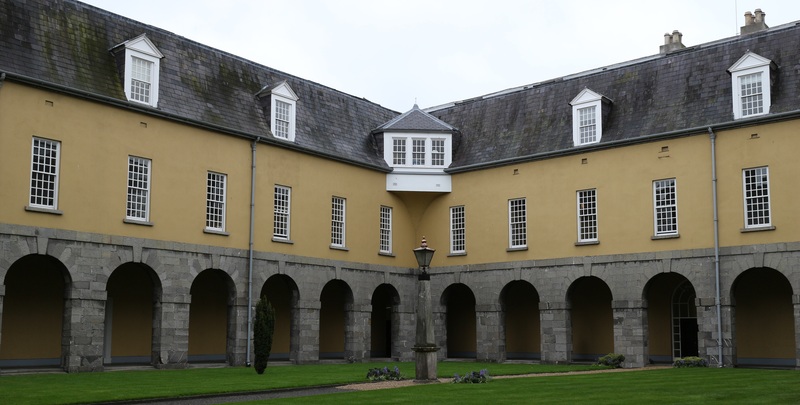 After its closure in 1987 the 19th and 20th century buildings were cleared away to reveal the original hospital, first opened in 1733 through the efforts of Griselda Steevens. 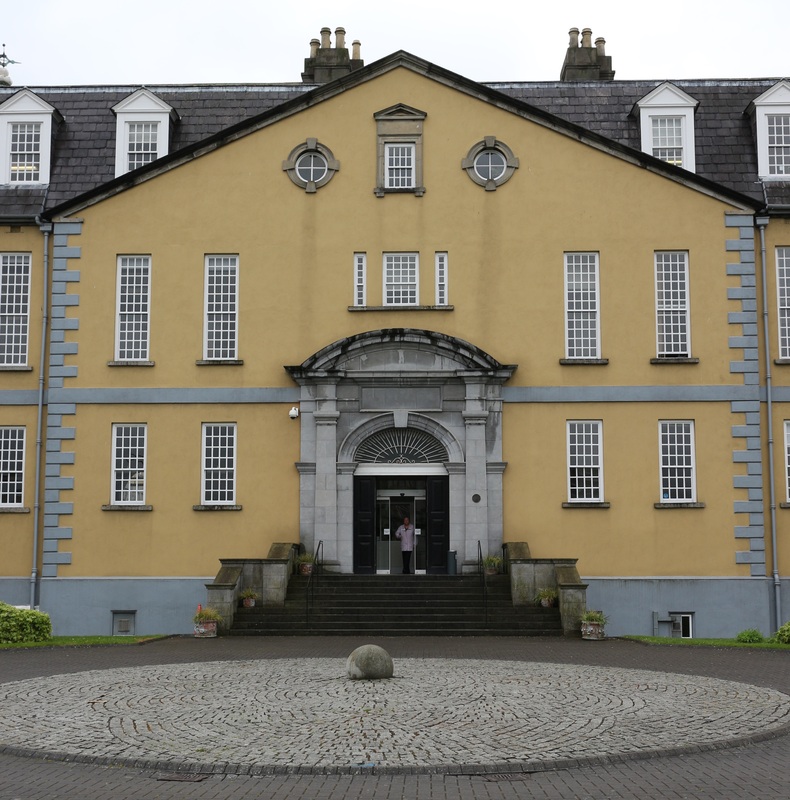 An important player in the history of medicine in Ireland, it is now an administrative centre for the Health Service Executive. Except for a brief period in the late 1980s and early 1990s it has housed a beautifully preserved early 18th century collection of books: The Edward Worth Library. The library is the only room in the building that still carries out the purpose for which it was designed. Edward Worth (1678-1733) was a trustee for Dr Steevens’ Hospital and left the institution £1,000 and his library, valued at £5,000. Anxious not to divert money from the care of poor patients, Edward Worth also provided for the set-up of the library. 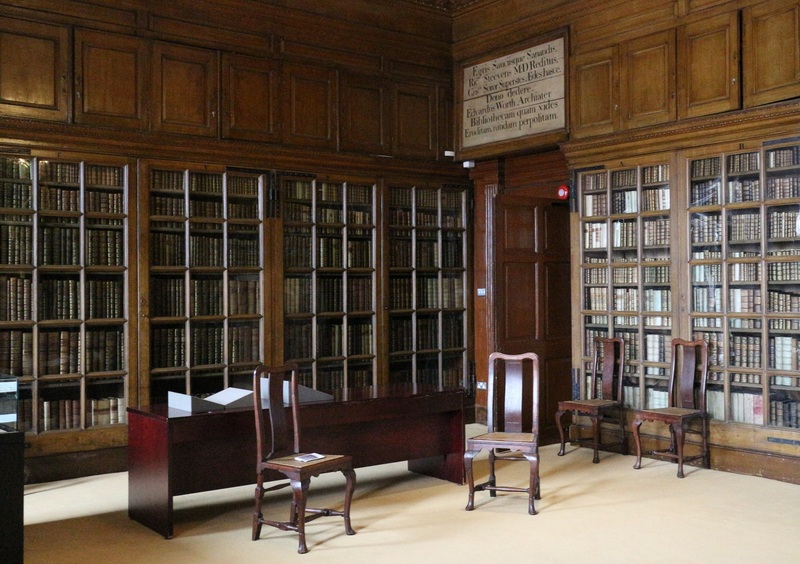 The executor paid £100 to fit out the room allocated to the library, receiving 1,000 books from John Worth’s collection in return (these were ultimately left by him to Trinity in 1742). Worth also left £50 for shelves and fittings and £30 for “some deserving person” from Trinity College Dublin to set the books in place. £20 was left to transcribe three complete catalogue of the books, one to be chained in the library itself and one each to go to Trinity College Library and Marsh’s Library. 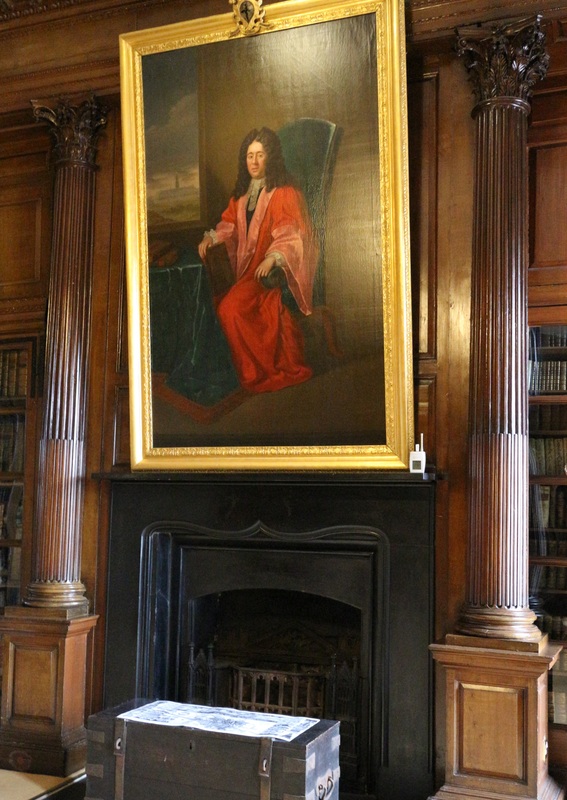 The executor, a nephew also called Edward Worth, was the driving force in setting up the library, paying an additional £35 for the outfitting from his own pocket and donating the portrait of the book-collecting Edward Worth which still looks down on the library today (Coakley, pp 43-44). The glass fronted cases and dim room have preserved the books in excellent condition. In his will Worth stipulated that access be restricted to the hospital’s chief surgeon, chief physician and the chaplain. The collection contains about 4,500 books, the vast majority of which were in that initial bequest, and included in the initial catalogue created in the 1730s. His collection spans four centuries, and three-quarters of the books are in Latin or Greek. The collection is based on books left to Edward Worth by his father, John Worth (1648-1688), Dean of St Patrick’s Cathedral Dublin, and books Worth bought as a medical student in Leyden. In 1723 Worth received an inheritance from his uncle William Worth and over the next decade systematically bought books. Some of his catalogues for auctions in Dublin, London, the Low countries and France are in the collection, complete with ticks beside items Worth wished to purchase. Unlike other Irish collections of the time such as those in Trinity College, the Bolton Library or Marsh’s Library, Edward Worth’s library had few theological works. The west wall houses the medical and surgical works, together with chemistry, botany and mathematics. The south houses reference books, history, topography and antiquities. The east houses the classics and the west theology and literature. A third of the books deal with medicine and science. The lack of annotation, even in the medical books (in contrast to other medical collections such as that of Elias Bouhéreau), suggests the books were rarely read if ever read. (The current librarian reports having found books with uncut pages.) It’s possible that the library was intended as a model for book collectors rather than as a working library. Among the medical books is the oldest book in the library, Benedict of Nursia’s 1475 De conservatione sanitatis, the first medical book printed in Rome. Others include the Eytmologicum Magnum Graecum by Zacharias Callierges (Venice, 1499), 16th century copies of Galen and Hippocrates, works on anatomy by William Harvey and Marcello Malpighi, and on obstetrics by writers such as Mauriceau (McCarthy, p. 30). The extensive collection on infectious diseases includes books and pamphlets on plague, smallpox, tuberculosis and syphilis. To learn more there are online exhibitions exploring infectious diseases, (see surgery and the Renaissance editions of Galen and Hippocrates). The science collection includes a core of books from John Worth. Founder member of the Dublin Philosophical Society, he had ten works of theology and natural philosophy by Robert Boyle, together with works by Francis Bacon, Descartes and others. To these Edward Worth added Boyle’s The sceptical chymist, Aerial noctiluca and a 1725 collection of Boyle’s philosophical works, Molyneux’s Sciothericum telescopicum, Berkeley’s Minute philosopher and theory of vision, Boate’s Natural history of Ireland along with scores of others spanning Aristotle and Georgius Agricola via Hooke and Newton to John Wilkes and Johann Zahn. To get some idea of the scope of the Worth Library holdings see the online exhibitions on botany, alchemy and chemistry, astronomy, Newton and Newtonian commentary, and the section Science at the Worth Library. The philosophy collection includes alongside Aristotle: Cicero, Pliny the elder, Senena and other classical writers along with Descartes, Montaigne, Machiavelli, Voltaire, Grotinus, Hobbes, Locke and Hume, to name just a few. Many of these early works reflect Worth’s interest in the book as material object rather than as just a vessel for knowledge. For example, Worth was interested collecting books from the Aldine Press, one of the most famous printers in the history of printing. Worth obtained 90 Aldines, including about 13 early Aldines. The clear script of the early Greek Aristotle matches the meticulous scholarship involved in creating the edition – and the high cost. (An online exhibition of Worth’s Aldines is here.) Worth also collected from other “scholar printers” such as Colinaeus, Stephanus, Turnebus and Elzevir (McCarthy, p. 30). The beauty of the volumes as one enters the library shows that Worth did not neglect bindings. He had many volumes ornately rebound in Dublin (we know this because volumes of a work that he obtained from different sellers appear in the library with matching bindings), but some books retain their original bindings, including skilful work from French binderies and gold embossed emblems relating to the original owners. (See section on book bindings). Worth seems to have had an interest in authors associated with Ireland. As well as Berkeley, Robert Boyle and Molyneux (including two copies of Molyneux’s Case of Ireland), he had works by John Colgan, Edmund Borlase, Edmund Campion, Geoffrey Keating, Edmund Spencer, Roger Boyle and James Ussher (McCarthy, p. 31). With charms to win, and sense to fix the heart! Thy crowd of captives and descend to me? The poem must have worked: Clothilde married Tickell in 1726. It seems likely that one of the crowds of captives she set free included Worth. When he died unmarried in 1733 his will (dated 1723) specified that the books in the glass case in his library, in English and including many volumes of poetry, were to be left to Clothilde (Coakley, p. 47 ). The bequest must have been refused since the books now rest in a case between the portrait of Worth and the door into the library. Over the other door hangs an inscription to the generosity of Dr Steevens and Dr Worth (Coakley, p. 45). To see the library, please make an appointment (opening hours and contact details). Prospective readers must abide by the rules of admission and apply in advance. Support the Edward Worth Library by making a donation or adopting a book. 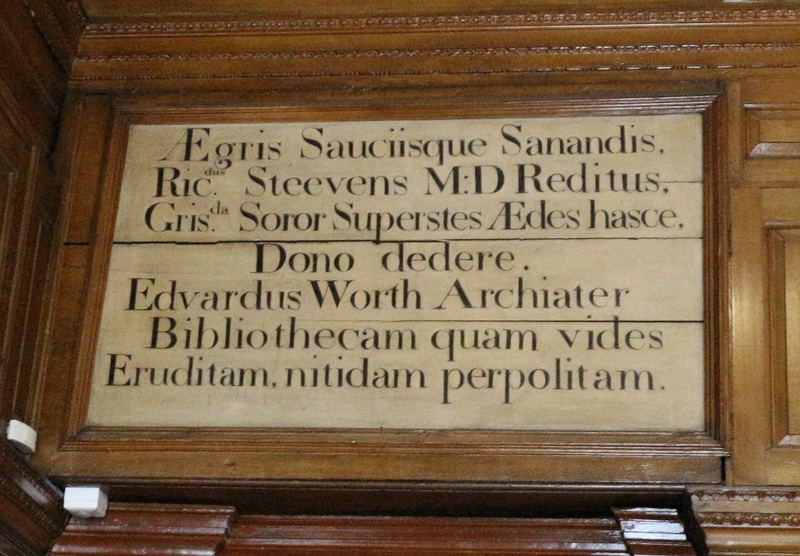 Edward Worth Library: The Enigma of Worth. Dublin City Libraries: digitised version of Edward Worth’s dissertation on Hippocrates, with English translation, the Dissertatio medica inauguralis sive commentarius in magni Hippocratis Lib, I.-Aphor. XXII., Utrecht (Trajecti ad Rhenum), 1701. Davis Coakley (2010) “Edward Worth and his Library” in Danielle Westerhof (ed) The alchemy of medicine and print: The Edward Worth Library, Dublin, Dublin:Four Courts Press, pp. 36-47.